The Lotka-Volterra equations, which describe a predator-prey system, must be one of the more famous dynamic systems. There are many generalizations and applications outside of biology. Wikipedia has a nice article, which I used as the basis for this simple model. 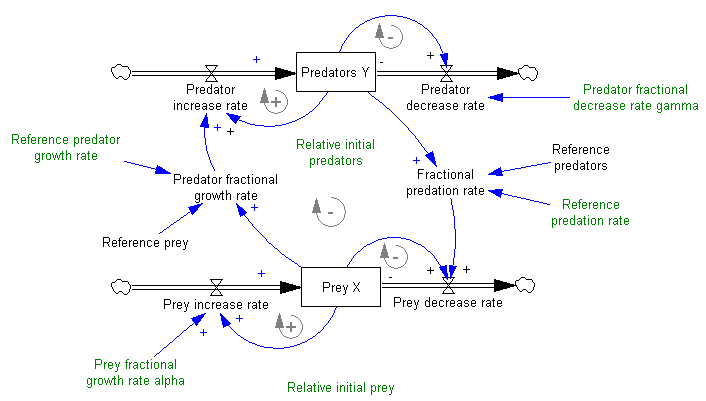 You can find an equilibrium at (Relative initial predators = 3, Relative initial prey = 0.5). An interesting experiment is to determine whether that point is stable. 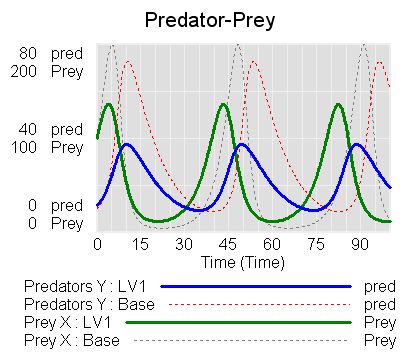 Another version of the model, which requires an advanced version of Vensim or the Model Reader, uses a subscript (array) to randomize the initial conditions for the predator and prey levels. That allows you to see the effect of the parameters over a variety of random realizations in the predator-prey phase space. Update: I wrote a bit more on this topic here. Can you please mail the Vensim equations of predator-prey system above. See my other comment – if you’re still having trouble I can post the vmf or mdl version. 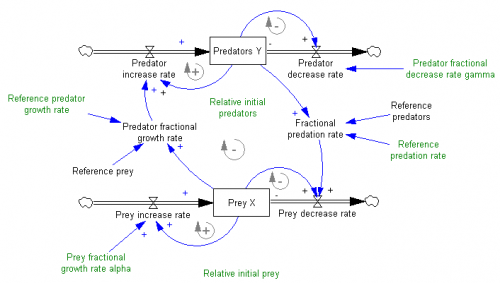 The various solutions of prey-predator model will show oscillatory nature of the population of the two species in a state of “dynamic equilibrium” even though there are very very few preys. If stochastic nature (e.g., random noise) is incorporated into the prey-predator model, prey (or predatory) might be extingushied and thus no dynamic equilibrium solution. Leif Gustafsson, “Poisson simulation-a method for generating stochastic variations in continuous system simulation,” Simulation, 74: 5, 264-274, 2000. Previous Previous post: Et tu, EJ?